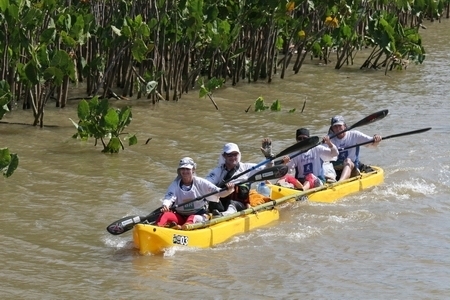 Team Nike just returned from Brazil where they raced in the Ecomotion Adventure Racing World Championships. In talking to them, it sounded like the heat was oppressive and the suffering was intense. Our team, made up of Mike Kloser, Monique Merrill, Chris Forne and Gordon Walker led for most of the race but a late navigational error put them second overall behind OrionHealth.com from NZ. The guys were a little disappointed for sure, but already focusing on Abu Dhabi next month. For that race, our team will be Mike Kloser, Michael Tobin, Chris Forne and me. Nora, Ian, Karen & Paul on their way to 3rd place at the World Championships! I also want to congratulate my friends on Team SOLE, who placed third at the race. SOLE took a nontraditional approach and raced with two women and two men (instead of the typical 1 woman, 3 men). Paul Romero, Karen Lundgren, and Ian and Nora Edmund (who were married two days before the race) had a very strong and smart race in order to beat most of the best teams in the world. Congrats! Check out more here. Juniper, Ian, Zulu, Hank and I are all headed to Moab this weekend for more training. Gotta get ready for that Arabian heat!